He is doing his utmost to fight it, but Rubens Barrichello's illustrious career appears to be turning full circle this weekend. The 39-year-old Brazilian veteran was born just down the road from the Interlagos circuit and raced here as a youngster, and now the track looks like being the stage for his final grand prix. 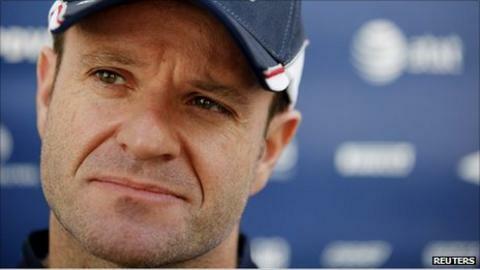 Barrichello, the most experienced F1 driver in history, does not see it that way. He is hopeful that he will find a drive to race on into an unprecedented 20th consecutive season in 2012. But the reality is that there appear to be no seats available for him. His many friends in the paddock - Ferrari's Felipe Massa and Red Bull's Mark Webber among them - are therefore urging Barrichello to treat this as a farewell race, so his home-town fans and F1 itself can give him "the send-off he deserves", as the Australian puts it. Barrichello, though, is not ready to accept that a love affair that has ruled his life is at an end. "Felipe has been very protective. As a friend he doesn't want me to go in vain and not having said goodbye to my people," Barrichello told BBC F1 chief analyst Eddie Jordan in a revealing interview that will be broadcast in two parts on BBC One on Saturday and Sunday. "I will never say goodbye to my people. I am a man of Brazil, of F1. My middle name needs to change to Rubens F1 Barrichello. I have no intention of saying goodbye. "Right now I am part of it, and it's almost like I feel I deserve next year. I will be 40, 20 years in F1, but I have so much motivation. It would be bad not to use my experience, but I can see myself here next year." Barrichello has been through a lot in his 19 seasons in one of the world's most demanding sports, but although he is nearing 40, he has shown no sign this year that his talent is fading away. That is a remarkable achievement for a man who made his grand prix debut in South Africa in 1993, in a race that featured Ayrton Senna and Alain Prost at the front of the grid, and who has since won 11 races. Barrichello impressed from the start of his career, running as high as third in a Jordan in the rain-soaked European Grand Prix at Donington Park in 1993, the race that has come to epitomise Senna's career. Barrichello's own time in F1 is indivisible from that of his late countryman. Senna took Barrichello under his wing when he arrived in F1 and went to see him in the track hospital when he crashed his Jordan violently at 140mph on Friday at the 1994 San Marino Grand Prix - two days before Senna himself was killed. There was a touching moment in his BBC interview here when Barrichello remembered a time when he went to Tokyo Disneyland with Senna in early '94, and recalled the delight with which the normally ascetic three-time champion tucked into a cheeseburger. Senna's death weighed heavily on Barrichello, not just because he lost a hero who had become a close friend, but also because the hopes and expectations of a huge nation now fell on his young shoulders. Initially, it was not an easy burden to bear - Barrichello has told me himself how hard it was to deal with that at the age of 22, with just one full season in F1 behind him. In time, though, he came to terms with it, and the nation's fans grew to love him, too. The cheering as he led his home race in 1997 at the wheel of a Stewart drowned out the sound of a full field of racing engines. And there were tears in 2003 when, now at the wheel of a Ferrari, he retired from a convincing lead when he ran out of fuel. The Ferrari years gave Barrichello all but two of his F1 wins, but they were tough for him, too, cast as he was into a supporting role to Michael Schumacher. So much has gone on behind closed doors that two men who share so much history now do not even pretend to like each other. Schumacher was the only driver not to turn up for the celebrations to mark Barrichello's 300th race in 2010, and here, asked if they were friends, Barrichello said: "Unfortunately not any more. We had great fun, he's a great guy outside, he's one of the greatest drivers, and with a glass of wine in his hand he can be very truthful. "But we started to be apart when we started not to race each other, we have a lot of respect for each other, but we don't have that relationship any more." Eventually, so tired did Barrichello grow of his supporting role at Maranello that he quit the team a year before the end of his contract to join Jenson Button at Honda. The decision led to three tough years as the Japanese giant squandered huge resources and fell further down the grid, until it abruptly pulled out at the end of 2008 - leaving the careers of both Barrichello and Button hanging in the balance. For a long time it looked as if time might be up for both men, but team principal Ross Brawn pulled his eponymous team out of the ashes of Honda, and the story had a fairytale ending as both men battled for the 2009 title, which was won by the Englishman. Two tough years at Williams years followed and Barrichello is again staring at the end of the line. The chances of surviving the cull for a second time look slim, but if he is again on the grid in 2012 he will be almost universally welcomed, for this is a man who is living proof that nice guys can win. "When we look ourselves in the mirror, we must enjoy (it)," he told Jordan. "The whole thing about F1 that the bad boy is the winner is wrong. I'm here to change that, (to show) you can be a nice guy." He glanced behind him at the Interlagos track, and the city-scape beyond. "I took Mark Webber to my apartment on Wednesday to show him a bit of Sao Paulo. You can have friends and still be tough here."